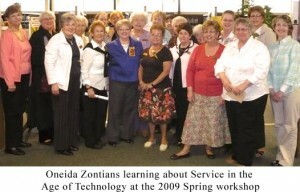 The Oneida Area Zonta Club is a part of Zonta International, District 2, Area 2. Our members are actively engaged in or retired from many various professions such as healthcare, education and business management. Locally, our club supports a number of causes such as Oneida Healthcare ER and scholarships and awards for high school and adult women.Our main focus is advancing the status of women, most notably through education. Our major fund raisers are the Billy Martin Circus and AMBA blood screening program. Monthly business meetings are held on the third Wednesday of the month from September to June. See our Calendar page for a detailed schedule.